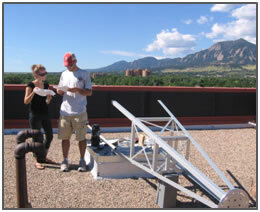 To operate CSSWE, a ground station has been built on the rooftop of the Laboratory for Atmospheric and Space Physics (LASP) in Boulder, CO. The CSSWE ground station operates in half-duplex mode, communicating at 437.345 MHz (UHF) for the uplink and downlink, the frequency designated by the International Amateur Radio Union (IARU). Commands are packetized and sent through Instrument and Spacecraft Interface Software (ISIS), commanding software that was inherited by LASP from the NOAA GOES-R program and has been customized for our uses. The Kantronics KAM XL terminal node controller (TNC) modulates/demodulates the signal, and the Kenwood TS-2000 radio is used to communicate at the UHF band. 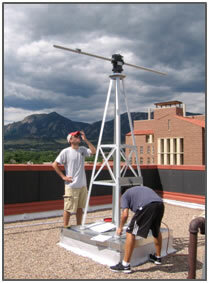 Two M2 436CP42 cross Yagi antennas are used, each with a gain of ~17 dBdc and a circular beamwidth of 21°. The antennas are pointed using a Yaesu G5500 azimuth-elevation rotator controlled by SatPC32, a software package developed for use with amateur satellites. This program also controls radio frequency to account for Doppler shift during passes. 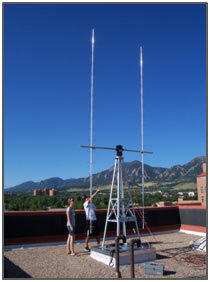 The antennas and rotator are mounted on an 8-foot tower installed on the LASP roof and connected to the ground station control room over ~200 ft of low-loss cabling, adding a total of -5.4dBm loss to the RF signal. The ground station has been fully tested, and was used to command the satellite in a simulated on-orbit scenario before satellite delivery. We successfully sent commands and received data over the RF link with the CubeSat at an off-site location running off of its battery and solar panels.